Okay, first a disclaimer. I really dislike the above picture and normally I wouldn't use something so bad but I know I've not been posting many recipes lately so I just bit the bullet and did it anyway. I have a myriad of excuses as to why the photo looks the way it does (the battery in my normal camera died so I had to use one that doesn't do well in low light, I'm trying to get used to the lighting in my new kitchen, etc.) but it's not very interesting and I don't feel like going into it. Normally, on the thankfully rare occasions where I'm not pleased with my photography I'd just wait and make the dish again and redo the pictures, then post them. But in this case, I had already made this dish twice in five days. It was unlikely that I'd be making it again very soon. Although I might. Ok so anyway, my dad was in town from Missouri this past week. He was here to help do a little work on the house, painting mostly. Several weeks ago I suggested half jokingly that he should come out and paint the new kitchen cabinets and shelves we had built in the living room. A few days went by and he called and expressed interest in doing it. Soon he'd gotten a plane ticket, he packed his tarp and a few paint brushes, I borrowed an air mattress from Annie and Pierson (for me and Mark, not for him. Don't worry) and the plan was set. The first couple nights he was here, we took him out to eat. But eventually, I wanted to make him a nice, home cooked meal. As my work day was drawing to a close, I thought back to a recipe in Nancy Silverton's book A Twist of the Wrist. From what I could recall, the ingredients list was minimal and would be quick and easy to find at any supermarket on my way home. Mark and I swung by Ralph's and got what I needed and as soon as I got home, I dug Nancy's book out of a pile of chaos in our second bedroom and got to work. Season both sides of the pork chops with salt and pepper then sprinkle over the pork rub, rubbing it into the chops. Set aside. To make the dressing for the slaw, combine the olive oil, balsamic, capers shallot, rosemary, and lemon juice. Season with the salt and pepper. To cook the chops, heat the canola oil in a large skillet over high heat for 2 to 3 minutes until the oil is almost smoking. 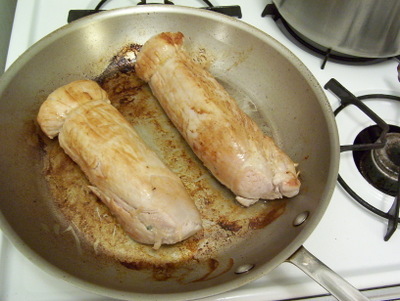 Carefully add the chops to the pan and cook for 3 minutes until they are a rich brown. Flip the chops, turn off the heat and let sit in the pan for 3 more minutes. 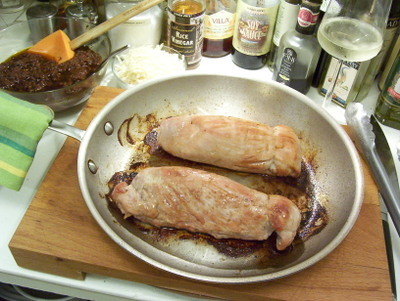 The pork will feel firm to the touch, but they should still be moist and juicy. Leave the chops in the pan while you finish the slaw. Pour the dressing over the shredded radicchio and using a pair of tongs, gently toss to coat and combine. To serve, place a pork chop on each plate and top with a generous mound of the slaw. The slaw is really interesting and unique and has a great contrast of flavors. The radicchio has a slightly bitter flavor which is balanced out by the sweet balsamic. The rosemary gives the dressing aromatic, woodsy notes and the capers a briney tang. 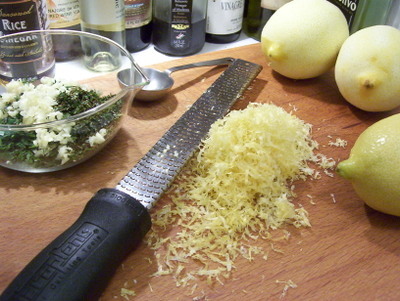 The lemon lightens the dressing and adds freshness. Cooking the pork chops over high heat does a couple things. First it gives the chops a nice crust and then the short cooking time makes overcooking the meat impossible. It's very easy to overcook pork so be careful. I have to confess, the second time I made this, I ended up overcooking them, although the meat was still very juicy. So just be careful. Note that the weight of each chop is less important that making sure that they all have the same 3/4 inch thickness. Last weekend the weather in LA was in the 90's. I was driving around with my air conditioner cranked to high and Mark spent the afternoon in the cool darkness of a movie theater. It seems a bit soon for that kind of nonsense and the idea of this kind of heat starting halfway into April was more than a little disconcerting. Concerns about global warming not withstanding, I'm just not quite ready for hot weather food. Preparing for cooler weather last fall, I had put together a mental list of dishes that I wanted to make, dishes that only seem suitable when the air is chilly, or at least brisk, things such braises, roasts, slow cooking, rich meats, hearty vegetables. Checking for forecast for the upcoming week I was elated to discover that the heat spell was indeed brief and temperatures were likely going to dip way down to the low 60's. People, in California, that's a cold snap. Despite the fact that the bounties of spring were starting to appear in full force at the farmers markets, I decided I needed to take this opportunity to make one last cold weather dish. 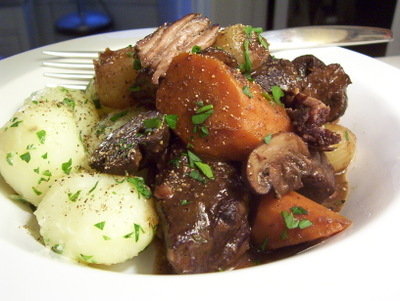 What could be more wintery than Beef Bourguignon? 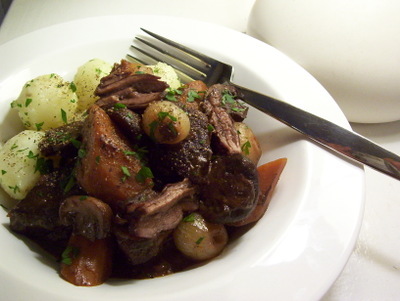 This version of Beef Bourguignon is a combination of three recipes that I liked the sound of but couldn't decide between. Part Ina Garten (the list of ingredients), part Martha Stewart's Everyday Food (the roasted pearl onions and mushrooms) and part Cooks Illustrated (elements of the technique). I have to say, I'm really pleased with the results. Heat the olive oil in a 12 inch skillet. Add the pancetta and cook over medium heat for 10 minutes, stirring occasionally, until the pancetta is lightly browned. Remove the pancetta with a slotted spoon to a large plate lined with a couple layers of paper towels. Pour off all but 2 tablespoons of the fat and reserve. 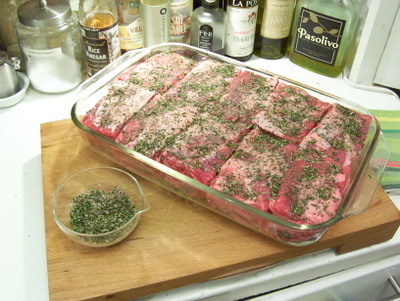 Dry the beef cubes with paper towels and then sprinkle them with salt and pepper. 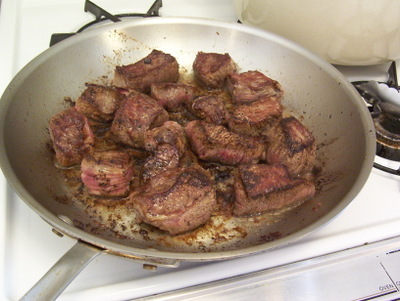 Increase heat to high and brown half of beef in single layer, turning once or twice, until deep brown, about 7 minutes. Transfer browned beef to a cast iron Dutch oven. 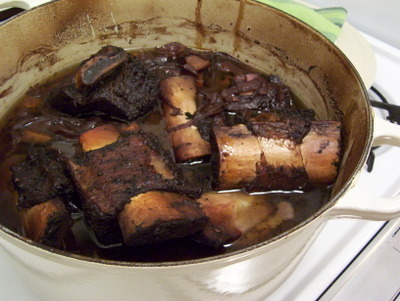 Pour 1/2 cup beef stock into skillet and scrape pan with wooden spoon to loosen browned bits; when pan bottom is clean, pour liquid into Dutch oven. Return skillet to high heat and add 2 teaspoons reserved fat and swirl to coat pan bottom. 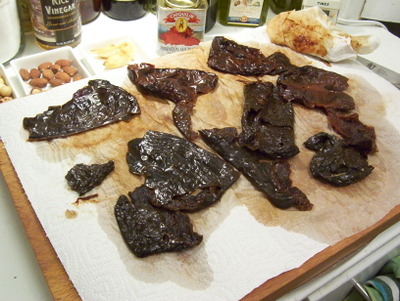 When fat begins to smoke, brown remaining beef in single layer, turning once or twice, until deep brown, about 7 minutes. Transfer browned beef to Dutch oven. Pour 1/2 cup beef stock into skillet and scrape pan with wooden spoon to loosen browned bits; when pan bottom is clean, pour liquid into Dutch oven. 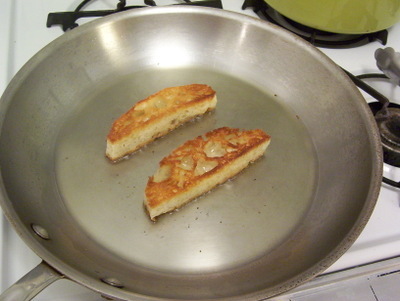 Pour the remaining fat into the skillet and heat over medium high heat. Toss the onions, carrots, thyme, 1 tablespoon of salt and 2 teaspoons of pepper in the fat in the skillet, stirring to coat. If there isn't quite enough fat left, add a tablespoon of olive oil. Cook for 10 to 12 minutes, stirring occasionally, until the onions are soft. Add the garlic and cook for 1 more minute. Add the Cognac, stand back, and ignite with a match to burn off the alcohol. 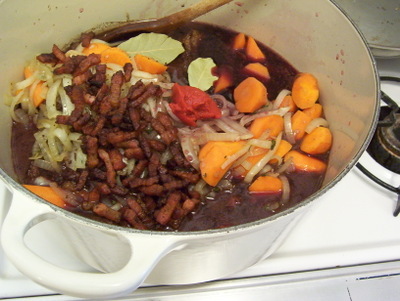 Scrape the onion and carrot mixture into the Dutch oven along with the pancetta, tomato paste, and bay leaves. Pour in the bottle of wine. Bring to a simmer, cover the pot with a tight-fitting lid and place it in the oven for about 1 1/2 to 2 hours or until the meat and vegetables are very tender when pierced with a fork. 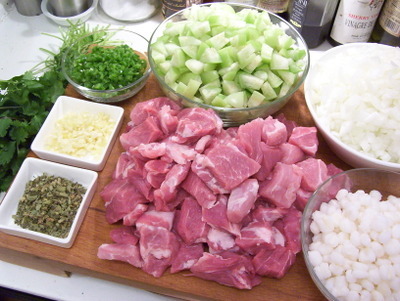 Strain the meat and vegetables into a large bowl and set aside. Crank the oven up to 425 degrees F.
Preheat oven to 425 degrees. On a separate rimmed baking sheets, toss mushrooms and onions with oil and thyme, then season with salt and pepper. Roast until tender and browned, stirring halfway through, about 30 minutes. While the mushrooms and pearl onions are roasting, combine 2 tablespoons of butter and the flour with a fork and stir into the stew. Simmer over medium heat and whisking occasionally to ensure the bottom isn't burning, until the sauce has reduced a little and thickened, about 5 minutes. Taste and correct seasoning. Return the meat and vegetables and gently stir to coat everything with the sauce. Keep warm over low heat. Once the mushrooms and pearl onions are finished roasting, scrape them into the dutch oven, stir gently to combine. Serve in wide, shallow bowls with boiled new potatoes tossed with butter, parsley, salt and cracked pepper. 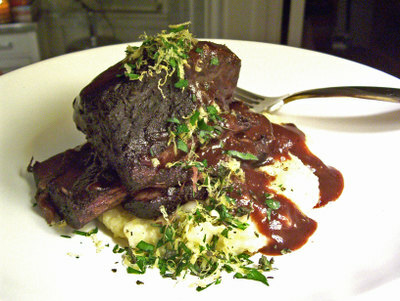 Braising well browned meat in wine is such a great method of cooking. If the beef is well marbled, during the long slow cooking the fat melts and the meat that's left behind becomes so tender you can just shred it with your fingers. The technique I borrowed from Cooks Illustrated, that of browning the beef in a saute pan and then using broth to deglaze, is really great. It seems to really intensify the rich, meaty flavor. 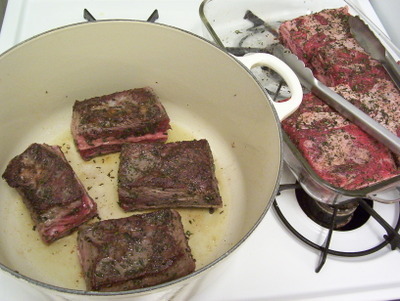 Plus since Dutch ovens are cast iron, they don't heat quite as evenly as a saute pan with the copper center and as such, I found that when I browned meat in a dutch oven, the cubes toward the center get significantly darker than those around the edge. 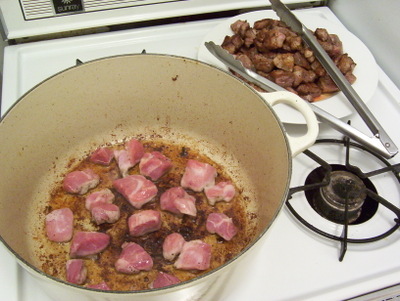 I really liked browning the meat in the saute pan and then transferring to the Dutch oven. The roasted pearl onions add a pop of silky, sweetness and the mushrooms play off the braised meat, adding an earthy depth of flavor. The carrots, which I was concerned might end up mushy, retain a really nice soft texture and, like the pearl onions, add sweetness but in more of a mild, subtle way. 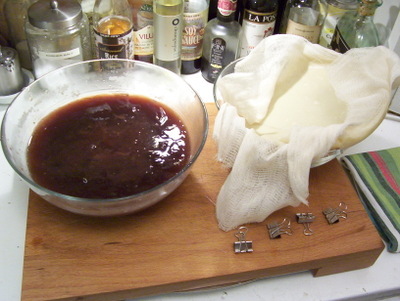 The red wine cooks down and thanks to the butter-flour mixture, thickens and becomes velvety with a glossy sheen. It's not super brothy, rather the sauce just coats everything and binds all the vegetables and meat together. You'll totally want something carby or starchy to soak it up, be it the boiled potatoes, mashed potatoes or as Ina Garten suggests in her recipe, buttery, garlic rubbed toast. Since it takes a bit of time to put together (particularly trimming the fat from the meat, takes a surprising about of time) this is obviously not a weeknight meal. As one of those dishes that tastes better the next day, it's a good candidate to entertain with. Just reheat over low, stirring often and you're set. 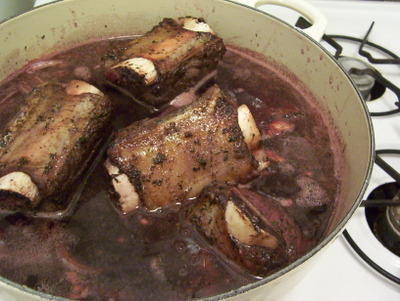 You may have to add a splash of beef broth or water, if the sauce has thickened too much overnight. A couple weeks ago, my friends Jeffrey, Oz and I went to a cooking demonstration at one of my favorite restaurants in Santa Monica, the Border Grill. Presiding over the demonstration were the two chefs/owners of the restaurant, Mary Sue Milliken and Susan Feniger AKA the Border Girls AKA Two Hot Tamales. Every so often the women host these demos at the Border Grill and they're really a lot of fun. A little elevated platform equipped with a little makeshift kitchen is built along one side of the dining room and as the women go through and prepare an entire menu starting with signature cocktails and appetizers going through dessert, servers bring out the same drinks and dishes for the audience to sample. Mary Sue and Susan are totally laid back, full of information (lots of tips about knife skills and care), and clearly love what they're doing. "Has everyone had a cocktail?" Susan shouts to the audience, as waiters carrying trays of cucumber mojitos and spiced sangria weave their way amongst the tables. That's my kind of cooking class. Free-flowing with booze. Mary Sue and Susan have that kind of relationship where they rag on and tease one another other. It's fun and lighthearted and the energy is infectious. It's a great way to spend the afternoon and at the end you get a small booklet featuring the recipes of all the dishes they made. This soup was the first course of the meal they prepared and when I tasted it at the restaurant I was blown away. 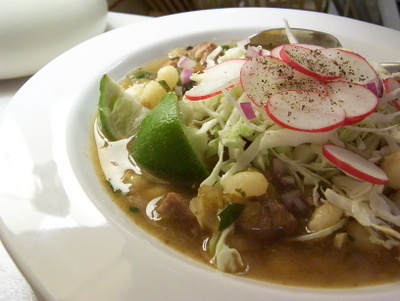 For those who don't know, "posole" is a Mexican soup/stew that is traditionally made with pork, hominy, and chiles and then garnished with cabbage and sliced radishes and a squeeze of fresh lime juice. It's as much about the garnishes as it is the soup itself, kind of like tortilla soup or even pho. Very DIY. Season the pork generously with salt and pepper. 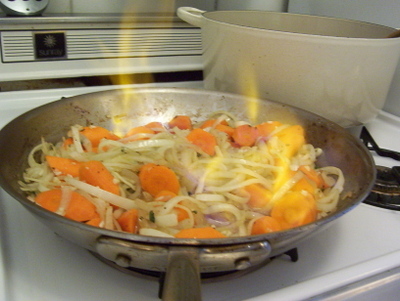 Heat the oil in a large, heavy-bottomed pot over medium-high heat. Brown the pork chunks on each side, making sure to get good, golden color. Be careful not to over-crowd the pot. As such, this will have to be done in batches. 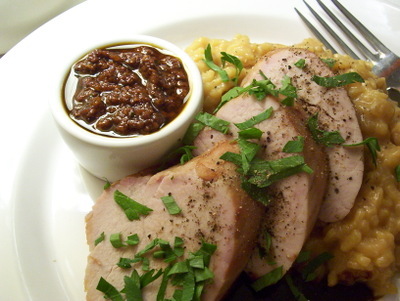 Reserve the browned pork on a plate, while you continue browning. Pour out the excess fat, then add the onions and a large pinch of salt. Saute for about 5 minutes, scraping up the brown bits that are left in the bottom of the pot. 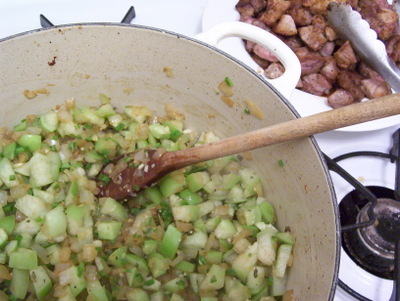 Add the tomatillos, jalapenos, garlic and oregano and continue to cook for another 3 or 4 minutes. Add the reserved pork, any accumulated pork juices, the chicken stock. Cover the pot, crank the heat to high and bring to a boil. Remove the lid, turn the heat down to low and simmer gently until the pork is tender and starting to fall apart, which should take about 1 1/2 hours. Add the hominy for the last 30 minutes of cooking. Stir in the cilantro and taste for seasoning. Ladle the soup into bowls and serve with the shredded cabbage, diced red onion, sliced radishes, and lime wedges. I can't speak highly enough about this soup. I'd have to go back through all the other soups I've made, but I think this is likely among the best. 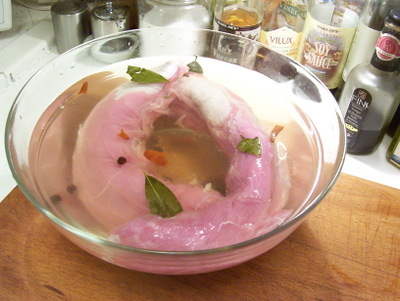 The broth is rich and flavorful with just enough thickness to give it some body. 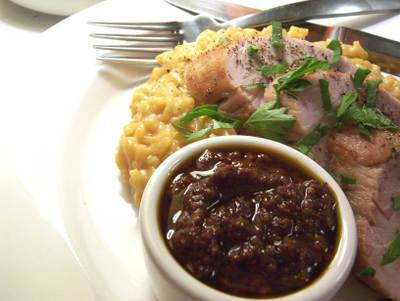 The slow-cooked pork is juicy and succulent, just on the verge of falling apart. The hominy is almost like little mini dumplings, starchy and soft. 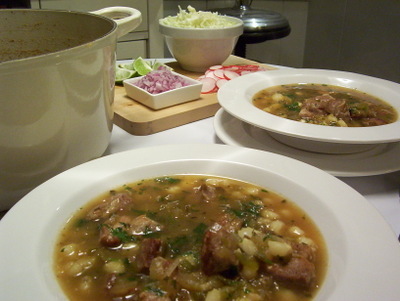 The combination of the tomatillos, cilantro, and lime juice lightens and freshens the richness of the soup. Then the shredded cabbage and peppery, shaved radish give it a really nice, crisp contrasting texture. As is often the case with this sort of dish, it's even better the next day. It would be great to make on a Sunday afternoon for a casual gathering. Maybe for a football game (not that I watch football). Just set out the pot of soup, bowls of the garnishes and to round it all out, chips and guac, maybe some quesadillas, and lots of cold beer. In fact the next time I make it, I may add some beer into the stock. That seems like a good idea, right? A couple years ago I was obsessed with developing a cooking show that was all about creatively repurposing leftovers. As a kid I hated leftovers and with this show, I wanted to demonstrate how leftovers could be utilized in new ways, expanding on the flavor profiles of the original dish but taking them in a different direction. But then came along a Food Network show called Quick Fix Meals, hosted by a glassy-eyed nutritionist/soccer mom named Robin Miller. The concept was essentially the same, but propelled by the boring cliche that in today's busy society who wants to spend all their free time in the kitchen? Soon thereafter, I lost interest in my project. Not to say there aren't multiple versions and variations on the same thing all over television, but the more I thought about it, the show seemed to have a pretty limited potential. I mean how many times can you chop up the remains of last night's dinner and toss it on top of a salad, tuck it into a quesadilla, or turn it into soup or whatever? The idea of repurposing leftovers resurfaced last weekend as I was braising short ribs for the little dinner party I was hosting. I purposely made twice the amount of meat that would likely be consumed by my guests and myself, with the intention of having plenty left over. 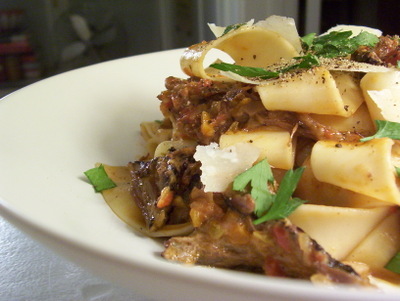 As I mentioned in my previous post, there are a number of ways one could go with the remaining braised meat, but that one that seemed most appealing to me was to morph it into a ragu to be served atop wide ribbons of pappardelle. For those of us who only know "ragu" from the jarred sauce one might find at the supermarket, the real thing bears little resemblance. 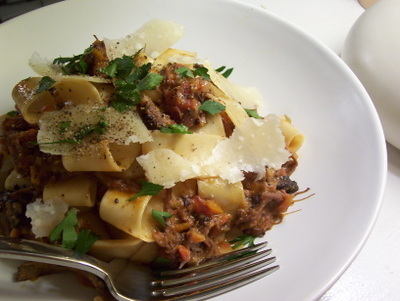 At it's most basic, a ragu is a very slowly cooked sauce made up of onion, carrot, celery, tomato and some sort of meat meat, be it beef, pork, veal, turkey, or game. The most famous is probably Bolognase. 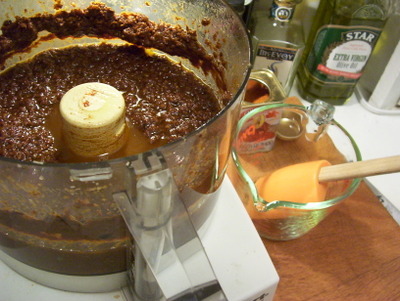 There is a great article in the LA times all about ragu's that can give far more information than I am capable of. Do check it out. 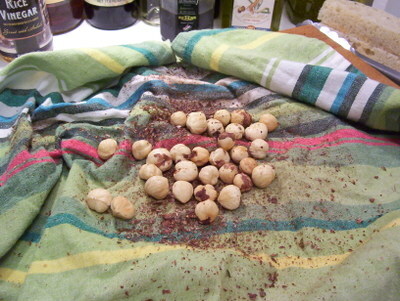 Place the dried Procini mushrooms in a small bowl and cover with 1 cup very hot water and let sit for 15 or 20 minutes. 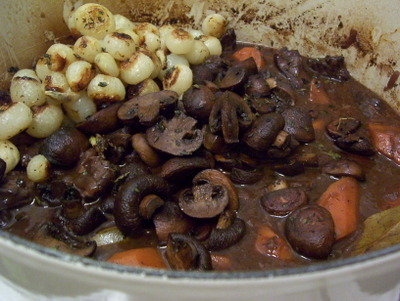 Once the mushrooms have softened, remove from the water and roughly chop. Meanwhile, pour the soaking liquid through a strainer lined with 2 layers of paper towel, to remove any dirt or sediment that may have been on the mushrooms. 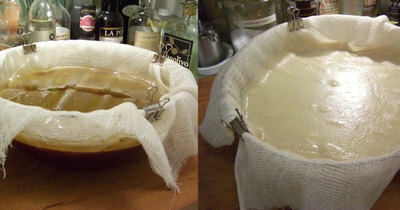 Reserve the strained soaking liquid. Place the chopped onion, celery and carrot in a food processor and pulse several times until the vegetables have been finely chopped. In a large sauté pan or deep pot heat 2 tablespoons of olive oil over medium high heat. Once the oil is glistening, add the chopped vegetables, thyme and red pepper flakes and cook, stirring occasionally for about 5 minutes, until the vegetables are soft. Add the chopped Porcinis and the soaking liquid, give it a stir to combine and cook until the soaking liquid has reduced down. Next add the beef stock and continue to cook until it's reduced down. While the stock is reducing, place the whole tomatoes and their juices in the food processor (you needn't bother washing it out first) and pulse until the tomatoes are coarsely chopped. 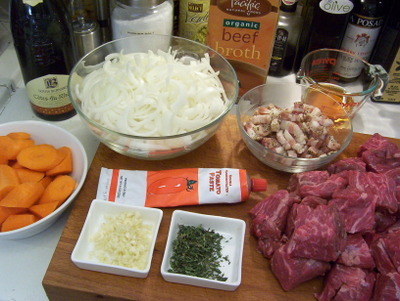 Add the tomatoes and the short rib meat to the sauté pan, reduce the heat to medium low, cover and bring to a simmer. 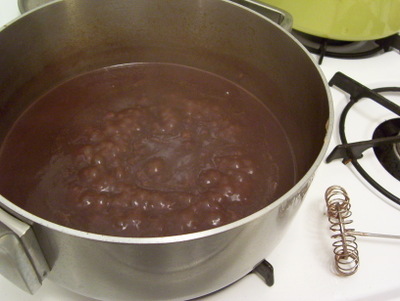 Remove the lid and continue to simmer for about 15 to 20 minutes. Stir in the milk or cream and simmer for another couple minutes. While the sauce is cooking, prepare the pappadelle according to the package directions. Always taste the pasta about 3 minutes before the package claims it will be finished cooking. In my experience the pasta is always done way before they say it will be. Drain the pasta and add it to the sauce in the sauté pan tossing with a pair of tongs to coat. Serve in bowls topped with a few shavings of Parmesan cheese, a light scattering of chopped parsley, and a grinding of black pepper. 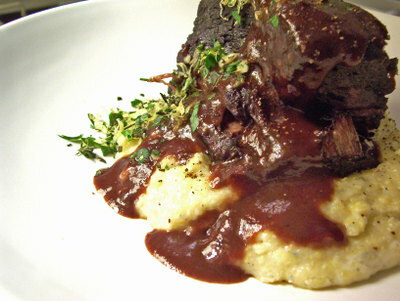 So, as much as I loved the short ribs in their original incarnation, I think I might like them better as a ragu. Might, being the key word. When combined with the sautéed vegetables, Porcinis, stock and cream, the wine-braised meat forms a robust, earthy sauce with an incredible depth of flavor. I seriously couldn't stop eating it. It's so right for colder weather.